Q. How do I narrow down my search results? 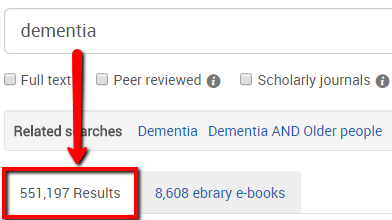 There are a variety of ways to narrow down your search results in a library database. The two most direct ways are to focus your search with more specific keywords and/or to limit by various criteria before or after searching. ​The more specific you are with your search terms, the more relevant your results will be. Searching for "Starbucks" will return thousands of articles about the company. To narrow your search, think of a specific thing you want to know about Starbucks. Let's say you want to know more about Starbucks' customer service. Searching for Starbucks AND "Customer Service" (use the whole thing, quotation marks and all) will return results about Customer Service in relation to Starbucks. using the word AND will make sure that the database knows that you want both keywords to be present in the article. using quotation marks " " transforms multiple words into one whole keyword. You can also use more focused keywords. Try using alternative keywords that mean the same thing or relate to the same topic. 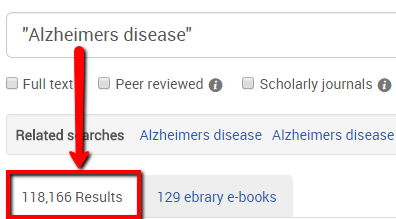 For example, search Alzheimers Disease as well as Dementia. Dementia refers to the symptoms associated with Alzheimers Disease. Each keyword will give you different results that relate to the same topic - so you want to make sure that you search both keywords. After performing a search, look for various limiters that you can refine your results by. ​As you limit by each criteria, your results will be narrowed down to meet your specified requirements. Note: you will need to reset your filters if you search on new keywords. You can also use the Advanced Search to limit by certain criteria at the very start of your search.